Calibrachoa hybrid ‘Tequila Sunrise’ is a Proven Winner® plant, which means this plant has undergone rigorous testing to be sure that it will perform in the garden under a variety of conditions. Superbells® Calibrachoa is more heat resistant than most of the Calibrachoas. It can take the heat of our hot southern summers making it a good replacement for petunias, and can be perennial in zones 7 and warmer. Superbells® Tequila Sunrise PPAF has orange blooms with splashes of red. Superbells® has a semi-upright growth habit, and larger leaves than other Calibrachoas, making it a great choice for hanging baskets, containers, and window boxes. Expect hummingbirds to visit your garden when you plant Calibrachoa because they love the trumpet shaped flowers and it’s good nectar source. Also great for borders, hanging baskets, window boxes. 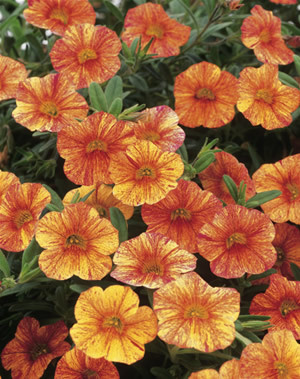 Calibrachoa hybrid ‘Tequila Sunrise’ Superbells® Tequila Sunrise PPAF can reach 7-10″ tall and should be spaced every 8-10″.